Of all the news that could have been announced at Monsterpalooza, this makes us the happiest. Ever since La Llorona and El Cucuy, we’ve been dying to have an original maze BACK at Universal Studios Halloween Horror Nights in Hollywood. John, Chris and the entire team truly set the bar high with their past original mazes, but I have the utmost confidence in their ability to deliver. 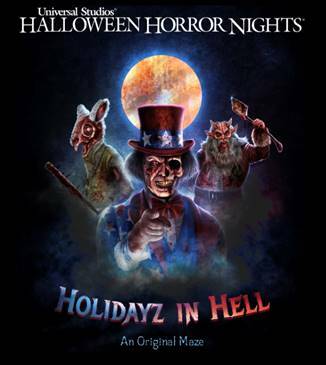 With the incredible popularity of the “Holidayz In Hell” scare zone last year, it was only right that it became it’s own full fledged maze. We are beyond excited to step into the demented holidays we know and love. Below is more information regarding the exciting announcement for HHN. Ah, the Holidayz from Hell have arrived. Those who survive the Holidayz need not let down their guard just yet as a creepy Christmas-themed scare zone with additional frights awaits to fill beating hearts with holiday fear. In addition to the music of Figure, who previously created a series of original sounds for Halloween Horror Nights, guests can expect to hear a new rendition of their favorite holiday tunes, remixed to accompany this hellish new maze.